Makes: Makes 1 dozen pies or 2 dozen cookies. 2In a large bowl, beat the butter and sugar for a minute or so, until well combined. It will have the consistency of wet sand. Add the egg and vanilla and beat until smooth. 3In a medium bowl, stir together the flour, cocoa and salt. In a small bowl, stir the baking soda into 1/2 cup very hot water until dissolved. 5Drop large, round spoonfuls of batter 2 inches apart on a cookie sheet that has been sprayed with nonstick spray. (If you’re making pies, try to keep the mounds similar in size and shape so they will make even sandwiches). Bake for 12–15 minutes, until the tops no longer appear wet and just spring back when lightly touched. Transfer to a wire rack to cool. 6Meanwhile, to make the frosting, combine the sugar, corn syrup, water, and egg whites in the top of a double boiler or in a clean stainless steel bowl set over a pot of simmering water. Make sure the simmering water doesn’t touch the bottom of the bowl or double boiler – you only need an inch or two of water in the pot. Beat the sugar mixture with an electric mixer on high speed for about 7 minutes, until it stands in billowy peaks. Remove it from the heat and beat in the vanilla. 7When the cookies are completely cool, spread the bottom of half the cookies with frosting or marshmallow cream, and sandwich with a second cookie. Store extras individually wrapped in plastic wrap. 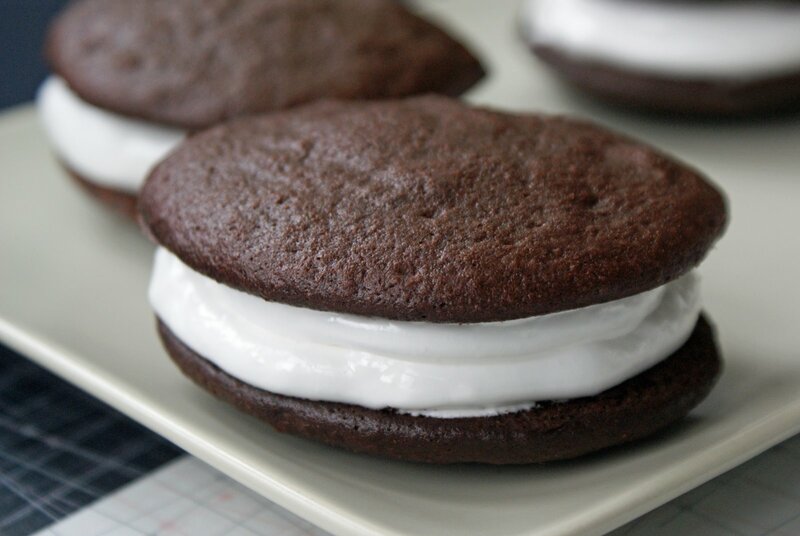 Makes about 1 dozen whoopie pies.